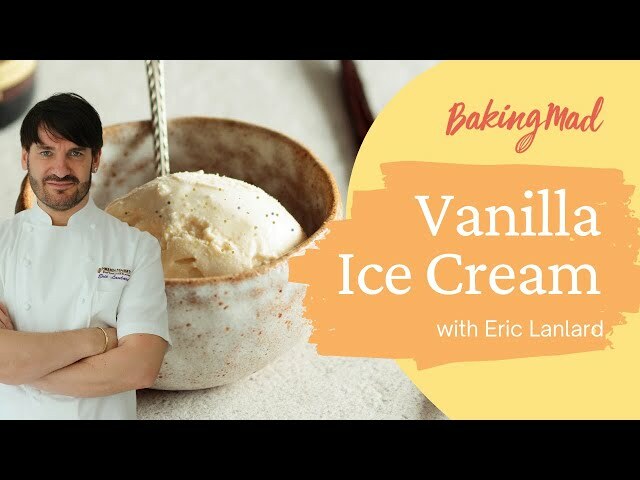 A beautifully simple, yet delicious vanilla ice cream. A worthy accompaniment to any dessert or works well on it's own as a dessert or a treat. Eric's top tips to make is even more special are: - Fold into the mixture some colourful rum soaked raisins. - Fold in peppermint crystal and dark chocolate chips for an “After 8” effect. - Crumble some soft nutty cookies. Put the egg yolks and golden caster sugar into a bowl and beat with an electric hand mixer for around 2 minutes until the mixture has thickened, is paler in colour and falls in thick ribbons when you lift the beaters. Using a measuring jug, scoop out around 125ml of the cream mixture and beat into the egg yolks to slacken them. Reheat the remaining cream until it just comes to the boil, take off the heat and stir in the egg yolk mixture.